In an essay first published in El País in 1988 the Spanish novelist Javier Marías, like so many before and since, wrote of the eternal character of Venice. His remarks, pointed squarely at a particular slice of the gente per bene (the ‘true’ Venetians) observed how, as part of the evening spectacle of ‘seeing and being seen’, “some ladies do rather over-adorn hands, ears and neck in their eagerness to outshine, well, themselves principally.” If you were to take a Saturday evening seat in the stalls of La Fenice, the city’s opera house, you might also observe this remarkable ability for certain Venetians to ornamentally disguise their age – and thereby achieve the same illusion of immutability that emanates from the city. 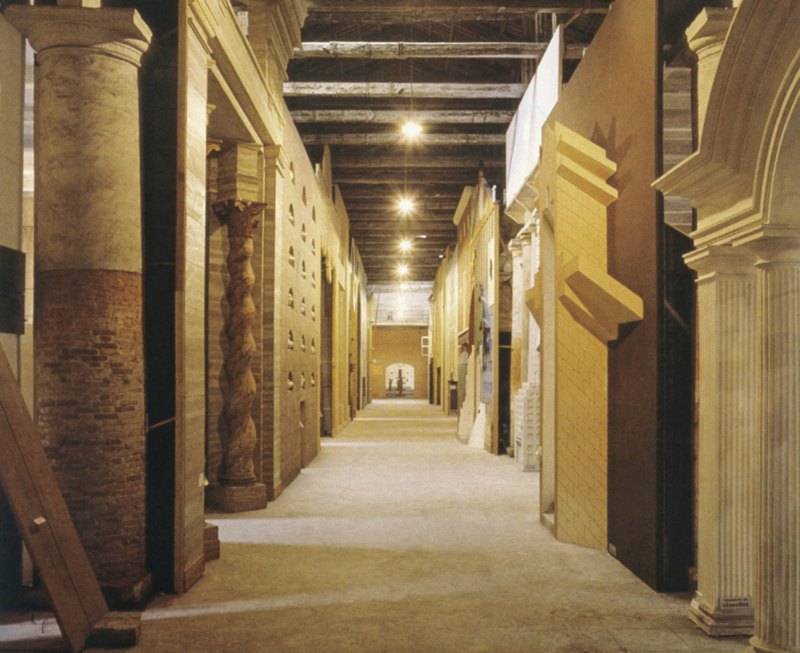 Deceptively young, the origins of the Venice Architecture Biennale have been both blurred and historicised by time. It was on July 27th, 1980 that the first Biennale Architettura opened in the Corderie of the Arsenale, a long upturned vessel of space in occupying the city’s former shipyards. Of this exhibition, which was known as La Presenza del Passato (The Presence of the Past) and curated by a young and ambitious Paolo Portoghesi, two images endure above all. The first, the Strada Novissima: a regimented street of façades symbolically addressing one another in resolute and emboldened silence. The second, Rossi’s teatro del mondo: a pontooned theatre which in and of itself has passed into the pantheon of the spectacular. Beneath the many assumptions and misconceptions which have thrived on this myth, a sound knowledge base of the installations and their implications for architectural exhibitions, the evolution of the Venice Architecture Biennale as a platform for discourse and display, and the postmodern movement more widely, has remained illusive. Exhibiting the Postmodern: The 1980 Venice Architecture Biennale, a seminal new text by architect, educator and critic Léa-Catherine Szacka, is a prodigious body of research—formed through extensive archival research, close readings of local and international interpretations of the event, and interviews with its curator and participants—traces the course of a path that catalysed a “decisive schism” in the architectural world: namely, the conceptual shift from ‘Modernism’ to ‘Postmodernism’. The canon of architectural exhibitions—from the 18th Century Parisian Salon, the Modernist shows in the 1920s and ‘30s, and the ‘post-Pompidou’ period of the 1970s—recounts a rich and rambling history. But the unique model of display ultimately adopted by the Biennale in Venice (of national participations and thematic exhibitions) was both born out of, yet distant from, this grand narrative. As a result, it has become established as the most important event of its kind. But scale and notoriety have fed an inescapable sense institutionalisation and, while the event may have dramatically grown in reach over the past four decades it has matured, on the whole, into an anodyne for the controversies and concerns that now face the discipline and the profession at large. Exhibiting the Postmodern, which should be considered to be the first authoritative account of this inaugural show, divides the discussion between history, description, context, and its wider implications. The Presence of the Past comprised seven sections, all preceded by a monumental yellow, blue and white entrance portal designed by Aldo Rossi – a nod, perhaps, to the lionised land entrance of the Arsenale. Its bold, bright form symbolised, above all, a sense of restitution: that the vast complex of rooms it heralded had been repatriated to the city as a semi-public, cultural space. Across this threshold, visitors were greeted by an homage to Philip Johnson, the architect who had once declared that “you cannot not know history” and, according to Szacka, the Biennale’s “real guest of honour.” He was, even then, considered by many to be a father of the postmodern crusade; the fact that he had been awarded the inaugural Pritzker Architecture Prize one year prior lent the show a degree of legitimacy. The Strada Novissima brought together twenty groups of architects from eight different countries, which counted among its ranks the likes of Graves, Gehry, Ungers, Venturi, Scott Brown, Hollein, Bofill, Koolhaas and Zenghelis. They were, aside from one or two Japanese and American (US) participants, all European and primarily formed of men – a bias which Szacka argues was the result of “numerous compromises and […] unforeseeable refusals to participate.” Those who took up the offer were invited to conceptualise and fabricate a façade designed to express “the sense of the form” particular to themselves, with a special reference to the theme of the show: “the relationship existing nowadays between the heritage from the past and projectual [sic] work.” Above the Strada, and accessed through Portoghesi’s façade, fifty-five architects of the “younger generation exhibited a Vasari Corridor of sorts, composed of self-portraits. At the end stood the critics’ exhibition – a smaller collection of displays developed by Charles Jencks, Christian Norberg-Schulz and Vincent Scully designed to offer the lay visitor a clearer understanding of the larger conversations at play. At the end of the Arsenale stood the teatro del mondo. Contrary to some schools of the thought, ‘Postmodern’ architecture was not born in 1980. That said, ‘The Presence of the Past’ did, in the words of Robert Stern, come “at the peak moment of [the movement’s] stylistic impact.” The word itself was notably absent from the title of show – a fact which Szacka indicates was the result of “lengthy and complex discussions” among the ‘experts committee’. Other potential titles that were considered included ‘The Future of the Past’, Dopo l’architettura moderna (After Modern Architecture), which also the title of a 1980 book by Portoghesi and, rather more emphatically, ‘POSTMODERN’. When the exhibition travelled to France in 1981, its title was revised to recall one of these early contenders: La présence de l’histoire. L’après modernisme (The Presence of History: After Modernism) suggested a more delineated break from the Modernist ideologue. The question of definition, however, remained – a point of contention which Szacka considers at length. The intellectual polemic which Exhibiting the Postmodern untangles is intricately tethered to the political, pedagogical and theoretical concerns of the time – many of which were focused on the very particular Italian (and more specifically Venetian, Roman, and Milanese) context. The epilogue, which is less sedate in pace than earlier chapters, presents a number of critical assertions. 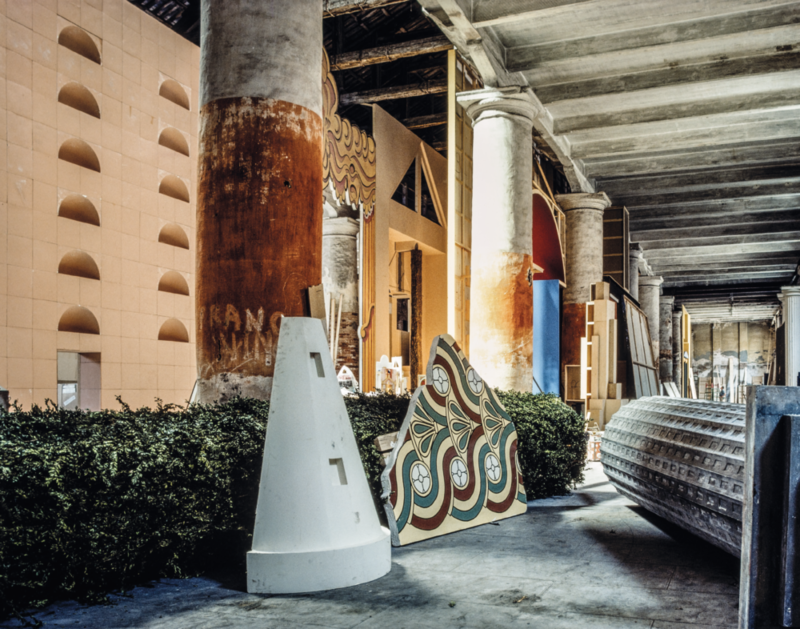 Among them, the notion that “the 1980 Venice Architecture Biennale acted as an anticipation of what architecture would become under the market economy” is key. By 2014, referring to the Biennale directed by Rem Koolhaas, “it seemed like the formula put in place at the start of the 1980s had been exhausted and needed reinventing,” Szacka argues. It is this concept of the ‘closing of the circle’—the suggestion that the 2014 incarnation attempted to close a discussion which was begun in 1980, and a comparison of the two—which sits at the heart of the author’s research.